View our Rooms & Rates, send an enquiry or book online. Our Room Accommodation and pricing - stylish and elegant, yet homely! Two priorities on the itinerary of most overseas tourists to South Africa are: To view the wildlife and to visit the picturesque winelands of the Cape. 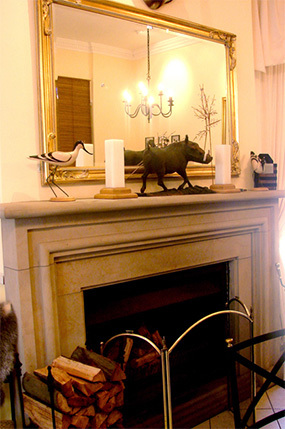 Both of these aspects are captured in the luxurious country hotel, Auberge de Courtrai, situated in historic Paarl, which is a 25 minute drive from Cape Town. Many years ago wild animals roamed in the same Berg River Valley, which is now home to South Africa's top vineyards. Auberge de Courtrai is a modern, luxurious country hotel which combines the Africa theme in an elegant, stylish manner with décor in earthy colours and focussing on the animal kingdom. From the moment you walk through the front door into the impressive entrance hall, the elegance and charm of this well loved and meticulously maintained establishment will be apparent. Here at the Auberge de Courtrai, the discerning visitor can stay in the cheetah, leopard, elephant, lion, zebra, monkey, impala or giraffe bedroom, all en suite, while enjoying traditional South African hospitality. Dinner on request in our spacious dining room with crackling log fire during winter. For that special occasion, the Auberge de Courtrai can provide 40 guests, with Zettie's renowned Cape cuisine at its best! Please note, prior arrangement is required.